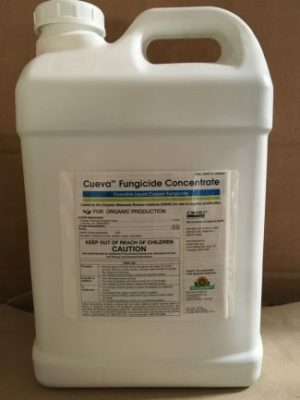 Certis Cueva is a broad-spectrum fungicide and bacteriacide. It has a lower metallic copper metal content as compared to the sulfates and hydroxides while still maintaining excellent disease suppressive characteristics. The lower copper content translates into lower burn potential and the ability to use the product multiple times through the season if needed. Certis Cueva has low burn potential. It can be used repeatedly with minimal copper build-up in the plant. *Care should be always taken when mixing micronutrients and any copper product as this can increase the burn potential of either product.